Combining both comfort and good looks, the 2002 Kawasaki Vulcan™ 1500 Nomad™ Fi V-twin touring cruiser represents the continuing evolution of the company’s Vulcan line. The Nomad’s elegant styling, comfortable touring package and performance-oriented features such as digital fuel injection demonstrate that this motorcycle is more than just another cruiser. 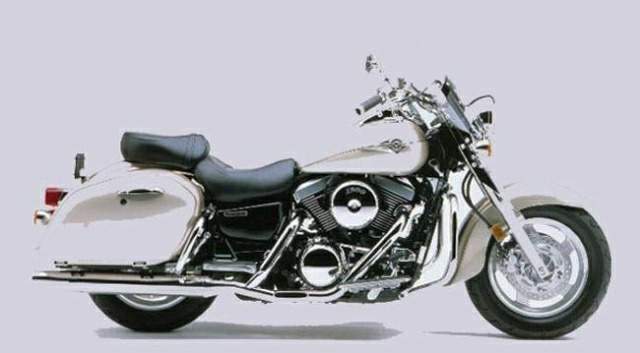 After earning “Cruiser of the Year” status from Cruising Rider magazine in 2000, the Nomad Fi was updated with a larger five-gallon fuel tank for greater touring range, an electronic speedometer and a repositioned steering lock. The result is an upscale yet traditional custom-style cruiser that comes in rich, two-tone paint schemes with copious amounts of chrome. Helping the Nomad Fi retain its traditional cruiser edge are elements like twin chrome exhaust pipes, chrome engine guards, rider and passenger floorboards, and polished alloy wheels. Equally important, however, are the unit’s touring accessories, such as an adjustable windshield, a sculpted seat for one- or two-up long-distance riding, ergonomic controls and adjustable levers. Distinctively streamlined hard saddlebags provide generous storage capacity for those hard-to-resist overnight rides. The big 90 cubic-inch V-twin engine in the Nomad Fi pumps out plenty of torque and power with its high-compression pistons and cam timing taken from the original Vulcan 1500. There are four valves per cylinder actuated by single overhead cams. Two valve springs are used on all valves to help ensure tight valve closure, while hydraulic valve lash adjusters automatically maintain valve clearance for smooth engine performance, reduced noise and minimal maintenance. Automatic cam chain tensioners keep cam timing accurate and provide greater reliability with virtually no upkeep. The right-side crankcase and clutch cover are designed to make it easy to check the engine’s oil level and to perform regularly scheduled maintenance. A Mitsubishi digital fuel-injection system feeds each cylinder a high-octane fuel mixture through dual 36mm throttle bodies. A separate intake tract for each throttle body provides smooth engine operation, and the tip of each injector contains four nozzles, with two of those aimed at each intake valve. Two different systems automatically and accurately control the amount of fuel injected into the cylinders. A 16-bit electronic control unit (ECU) features injection mapping and programming tailored for the Nomad Fi touring model and its particular requirements. Using readings from sensors, it monitors engine coolant temperature, intake air temperature, atmospheric pressure, intake air pressure and throttle position to adjust the amount of fuel injected. The result is excellent engine response and power coupled with increased fuel efficiency. The ECU is also equipped with a special pin that allows technicians to check the fuel injection system as needed. A gear-driven engine counterbalancer and rubber engine mounts reduce handlebar and floorboard vibration without interfering with the engine’s distinctive V-twin rumble. The engine produces almost 85 foot-pounds of torque at 2,500 rpm so that a crack of the throttle punches out smooth acceleration. A long, low-slung chassis provides this Kawasaki with the classic cruiser look. The Nomad Fi’s floorboards are positioned to put the rider and passenger in upright and comfortable positions. The rear brake pedal is designed to make it easier to apply the dual-piston-caliper-equipped brake. Among the unit’s other convenience features are an ample five-gallon fuel tank for those high-mileage journeys and self-canceling turn signals for easier use. The Nomad Fi’s elegant-looking fuel tank is topped by the electronic speedometer, eliminating both the speedo cable and drive unit for a cleaner look. The speedometer face atop the gas tank features an LED display for the odometer and tripmeter, as well as a clock. Part of the attraction to the cruiser lifestyle is customizing the motorcycle to fit individual design and performance needs, so Kawasaki offers its own line of FIRE & STEEL™ accessories. Customers can choose from backrests, driving lights and other chrome parts to customize their Nomad motorcycles and to create their own unique vehicle statement. Or they can simply appreciate their stock Vulcan 1500 Nomad Fi for its comfort, performance abilities and styling enhancements.